There are some pieces of jewelry, like pearl earrings and a classic pendant necklace, that all women should own. However, you don't want to wear these basic pieces every day. Jewelry should be an expression of your individual style, and you have a lot of personality, so switch things up! Put your individual stamp on your jewelry choices by following these suggestions for adding layers and sporting multiple pieces at once. ou don't have to choose between silver and gold accessories; modern trends let you wear both at once. You can even add more unusual tones like pewter and gunmetal without matching them to the rest of your outfit. Metallics have become neutrals, so they’re infinitely flexible. Mixing metals allows you to get the most out of your jewelry wardrobe. You no longer have to alternate between your favorite silver pendant and your gold charm necklace--you can wear them both at once. More importantly, layering multiple metals adds contrast to your outfit and makes your jewelry appear sophisticated, chic and modern. 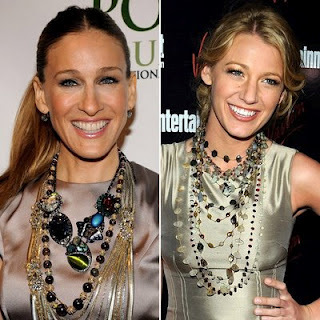 When layering necklaces, make sure that each necklace style is distinct and that the pieces are in different sizes. So, if you're sporting a dainty pendant, choose a more substantial piece, such as a trendy clock necklace or a string of wooden beads, as your second accessory. For a classic layered look, replace the wooden beads with a sizeable strand of pearls, which are trending this season. Wearing jewelry in contrasting sizes draws attention to each piece. The look is also organic and easy; it appears that you've chosen the necklaces because you love them, not because they match your outfit. Look beyond traditional metal jewelry and add pieces made of more unique materials. For a thoroughly modern style, pair your silver tennis bracelet with a braided leather cuff or a wish bracelet made from cotton cord. You can also give beaded bracelets a try. Thick, recycled glass beads will definitely hold their own against a more traditional gold bangle. If you're mixing rings, try adding a glass band under an aquamarine cocktail ring. Jewelry is no longer limited to just metals and gemstones. You can find pieces made from every imaginable material, and you can layer these innovative pieces with the traditional jewelry you already own. Your jewelry tells people who you are and how you approach the world, so don't limit yourself to the same accessories every day. Build a jewelry wardrobe with as much personality as you have. Then make sure that the world sees your eclectic, sophisticated and on-trend sense of style by layering those pieces to create interest and contrast.